Gus Albor’s Temperatura acrylic base abstraction articulates attentiveness to the interplay between two opposing colours. Giving a presence of dark rainy clouds before a storm atop a mountain that whirls up. Seeking refuge in the wild huddled beneath a boulder. After the weather changes from blue skies to a deluge of thunderous downpour. The painting symbolizes a journey backwards through time. Before the typhoon – the calm before the storm. Remembering what once was. Allowing closure to move forward in life with a positive attitude. It is a painting symbolism of hope, sympathy and encouragement in every storm in life. Gus Albor’s art is a gestural brushwork and existential angst of an abstract minimalist. It is a deliberate lack of expressive content. The artist focusing on the informal elements of art making. 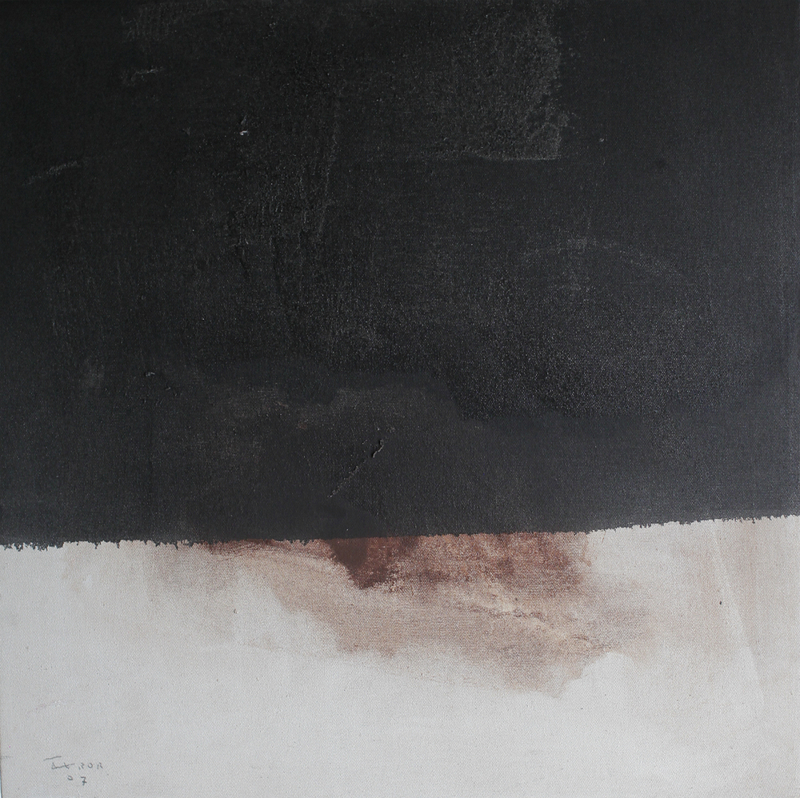 First, by expanding his initial monochrome palette of greys, whites and earth. Into the third dimension through the incorporation of stark elements onto the canvas. Giving his art an illusionistic representations of the visual world. Creating the appearance of a three-dimensional space within their picture. Emerging out of the canvas and into the space of the viewer. The artist redefines the color spectrum to make his works inexpressive, conceptual and non-referential. The minimalist, Albor, allows the audience instinctively give an immediate visual response. For the viewer to experience all the more the pure qualities of colour, form, space and materials. To explore without the distractions of composition, theme, and other elements. Stripped of all thematic or emotional content. Gus Albor is a practitioner of nonrepresentational painting. Rather than artwork alluding to underlying, meanings, emotions, or narratives. Working according to the minimalism principles of line, plane, volume, and point, within space. He explored the tension between the arrangement of colors on the flat surface of the canvas. As well as the optical effect of the artwork. His spare abstraction sought to de-mystify art. To reveal its most fundamental character: the medium and materials of his work. Where its reality, and that is was what Gus Albor wanted to portray to delineate space.